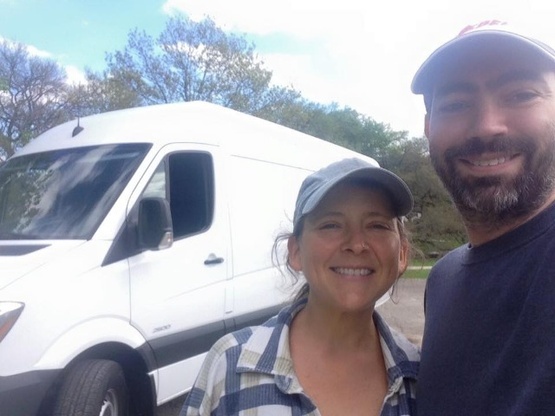 My wife and I left the corporate world last year and are finally stretching our legs and traveling the US. We've lived full-time in a 5th wheel for several years now, but hadn't done much traveling until now. We built a camper van from a brand new Sprinter cargo van and are currently chasing the sun through the winter. Handy with a hammer or a computer. No. We hope to have chickens though! We purchased 18 acres in Rock Island, TN a few years ago and have just started building a small off-grid farm. Looking forward to playing in the dirt! These kids were great Boondockers. They didn’t stay long but the were absolutely welcome too. Anytime time you kids get close come on back. We greatly enjoyed our time with these travelers. Welcome back anytime! 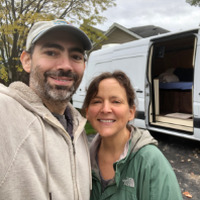 Brian and Michelle were delightful and demonstrated their creativity by building their own RV out of a van shell. Very smart people indeed. They are most welcome to show up again any time and we hope to use their spot in Tennessee once their adventure is complete.